Total is a global business, with operations in more than 130 countries. Innovation is also key to to Total success, and so is Totals’ focus on sustainable energy. In the second of the three #MyTotalCampus challenges for 2016, Total want to know what makes your campus a hub of creativity, great ideas and smart thinking. 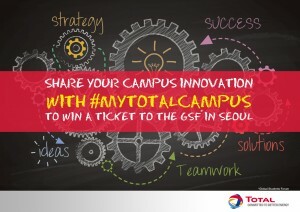 Use your camera to show the world what is innovative on your campus and you could win a trip to the Global Student Forum in Seoul, South Korea in November. The Competition is open to all adult students over the age of legal majority in accordance with their country legislation and validly registered as students at the date of the Competition opening and be studying a Bachelors, Masters or PhD-level qualification, or the local equivalent, at a recognised degree awarding institution, such as a University, Grande Ecole, College or Fachochschule, on a full-time or part-time basis (hereinafter “Participant(s)”). 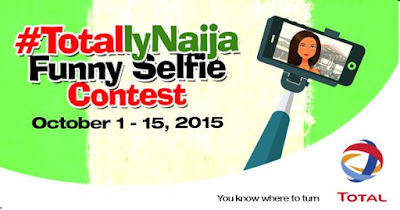 The Competition requires all Participants to own a Facebook, Twitter or Instagram account in order to post photographs and up to 10 seconds video materials on any said social media networking platforms. 1st phase: Pre-selection of photos and video materials on the following platforms: Facebook, Twitter or Instagram. Any other form of participation is excluded. 2nd phase: Public voting on the Organising Company website: total-campus.com. A jury of Total representatives will be looking for the most creative and visually striking photos or short videos that really capture innovation of every kind on your campus. Submit your entries with a caption of no more than 140 characters between 17 May and midnight CET on the 19 June 2016. Entries from all over the world will be showcased here on the Total Campus website, with the top entries then opened to a global online vote on 4 July. The vote will close at midday CET 18 July 2016. (*value no more than 2000€). Share your picture / video via your Facebook, Twitter or Instagram account mentioning your university / school and the country where the photo is taken and a short description of your campus’ innovations, in 140 characters max.